This example shows how to use the Library Compiler app to create a Python® package using for a MATLAB® function. You can then pass the generated package to the developer who is responsible for integrating it into an application. This example also shows how to call the Python package from a Python application. The target system does not require a licensed copy of MATLAB. At the MATLAB command prompt, enter makesqr(5). On the MATLAB Apps tab, on the far right of the Apps section, click the arrow. In Application Deployment, click Library Compiler. In the Type section of the toolstrip, click Python Package. In the MATLAB Compiler project window, specify the files of the MATLAB application that you want to deploy. The function is added to the list of exported function files. Repeat this step to package multiple files in the same application. For this example, select the makesqr.m file that you wrote earlier. Runtime downloaded from web — Generate an installer that downloads the MATLAB Runtime and installs it along with the deployed MATLAB application. You can specify the filename of the installer. Runtime included in package — Generate an application that includes the MATLAB Runtime installer. You can specify the filename of the installer. The first time you select this option, you are prompted to download the MATLAB Runtime installer or obtain a CD if you do not have Internet access. The Library Name field is automatically populated with makesqr as the name of the package. Rename it as MagicSquarePkg. The same name is followed through in the implementation of the package. For more information on naming requirements for the Python package, see Import Compiled Python Packages. Add MATLAB files to generate the sample Python driver files. Although Python driver files are not necessary to create packages, they are used to demonstrate how to Install and Run MATLAB Generated Python Application. 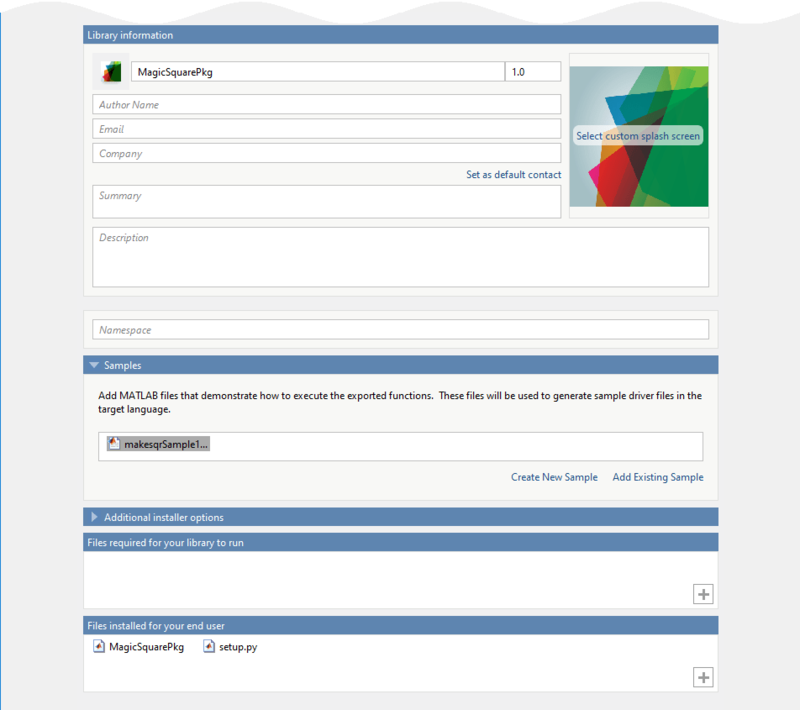 In the Samples section, select Create New Sample, and click makesqr.m. A MATLAB file opens for you to edit. Define the input variables as necessary for your application, save the file, and return to the Library Compiler app. For more information and limitations, see Sample Driver File Creation. Library information — Information about the deployed application. You can also customize the appearance of the application by changing the application icon and splash screen. The generated installer uses this information to populate the installed application metadata. See Customize the Installer. Additional installer options — Default installation path for the generated installer and custom logo selection. See Change the Installation Path. Files required for your library to run — Additional files required by the generated application to run. These files are included in the generated application installer. See Manage Required Files in Compiler Project. For more information about the files generated in these folders, see Files Generated After Packaging MATLAB Functions. PackagingLog.txt — Log file generated by MATLAB Compiler™. After creating your Python packages, you can call them from a Python application. The Python application that you create uses the sample Python driver code generated during packaging. The Python driver code calls the Python packages, and it is based on the sample MATLAB file you selected in previous setup steps. These steps are also explained in the GettingStarted.html file in for_redistribution_files_only folder. Before starting, make sure that you Install and Configure the MATLAB Runtime (MATLAB Compiler), and that you have Python installed. Copy and paste the generated Python driver code file from the for_redistribution_files_only\samples folder into the for_redistribution_files_only folder created when you created the shared library. Use the system command line to navigate to the for_redistribution_files_only folder, where you copied the generated sample Python driver code file. Install the application using python at the system command prompt. From the system command prompt, run the application. If you used sample MATLAB code in the packaging steps, this application should return the same output as the MATLAB code. On Mac OS X, you must use the mwpython script. The mwpython script is located in the matlabroot/bin folder. matlabroot is the location of your MATLAB installation.